Easy-CLICK is a high definition speaker and ear tip combination that provides exceptional sound quality and high frequency performance. Easy-CLICK tips are an essential part of a patented comfort technology. This unique technology creates an ultra soft and gentle fit in the ear resulting in an open and natural feel. Easy-CLICK tips are so soft and comfortable, people often forget they’re wearing them. Easy-CLICK tips utilize an ultra thin membrane for the ultimate comfort experience. Multiple flex zones with 360° mobility ensures your easy-CLICK tip will adapt vertically and horizontally to canal bends. The soft tip retains the true shape of your ear canal and eliminates the occlusion effect for both open and sealed fittings. 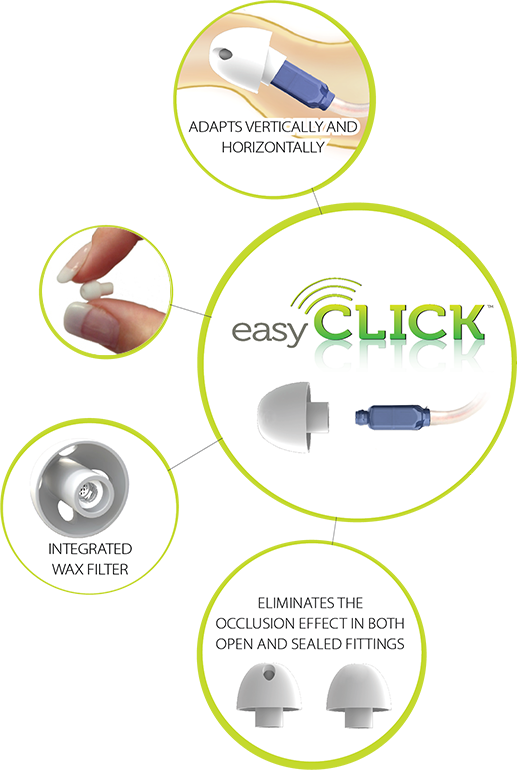 Easy-CLICK also incorporates a wax filter built into the tip and a second, Moisture Protection System (MPS) nano-coated filter on the speaker housing, giving the user unparalleled protection against both wax and moisture. Easy to Use. Easy to Replace. Not only is the new easy-CLICK system more sanitary, it lasts longer and ensures a more consistent, reliable performance. User-replaceable tips cut down on service visits and repairs saving you both time and money.